It is with a heavy heart that we announce Lily crossed the Rainbow Bridge on May 12th. She was an amazing puppy and brought joy to everyone she met. She certainly didn’t let the bad times get her down and even in her last days would muster up the energy to play with her foster mom and sisters. She never met anyone she didn’t like and was so smart. In the end, we will never know for sure what was causing her seizures. However, we do know that even with her little growing body, the seizures progressed too fast for any medicine to be able to keep up with them without becoming a lethal dose themselves. In the short time Beau’s Bridge Club was able to care for Lily, we were inspired by her exuberance for life. Even when it was clear she wasn’t feeling well, she would know we sensed it and try to comfort us! Her life and approach to it will never be forgotten. Goodbye, little girl. We will see you on the other side of the bridge. In the meantime, enjoy being pain free and rolling in all the smelly things you find. Lily the puppy (born 11/24/14) is a happy-go-lucky kind of girl. She’s very outgoing, and sweet, though she’d rather be running or playing tug of war than snuggling most of the time. She’s also very smart and has mastered sit, crate training, and is currently working on ringing a bell to tell people she needs to go potty. She has lots of energy and loves to expend it zooming around the backyard, going on hikes and walks, using her brain to learn new tricks, and sniffing for any morsel of food she can find. Lily also loves going to the dog park and hasn’t met a dog she didn’t like. She’s also loves cats, though she hasn’t quite mastered the difference in cat language between “let’s play” and “leave me alone”. Lily also loves every person she meets, though she isn’t big on petting and cuddling until she’s expended all her energy and tuckered out. Lily is a special needs pup, though she doesn’t really know it. She has seizures and muscle spasms. Good news is that her seizures are controlled by a twice daily medication. Unfortunately, she does still have minor muscle spasms that cause her to look startled repeatedly for a few minutes at a time. These spasms only happen a few times a day, and she seems a bit confused by them, but otherwise unaffected. As soon as they are done, she’ll go on her merry way as if nothing happened at all. We do not know what is causing her symptoms as there is no way of knowing for sure without her ability to speak to us and tell us what she actually experiences. This does leave us with a few unknowns for her future such as lifespan and if anything will change as she grows into an adult dog. What we do know is that she loves life, lives in the present, and brings joy to everyone she meets. If she had a superpower, it would be capturing the hearts of everyone and making their day brighter. 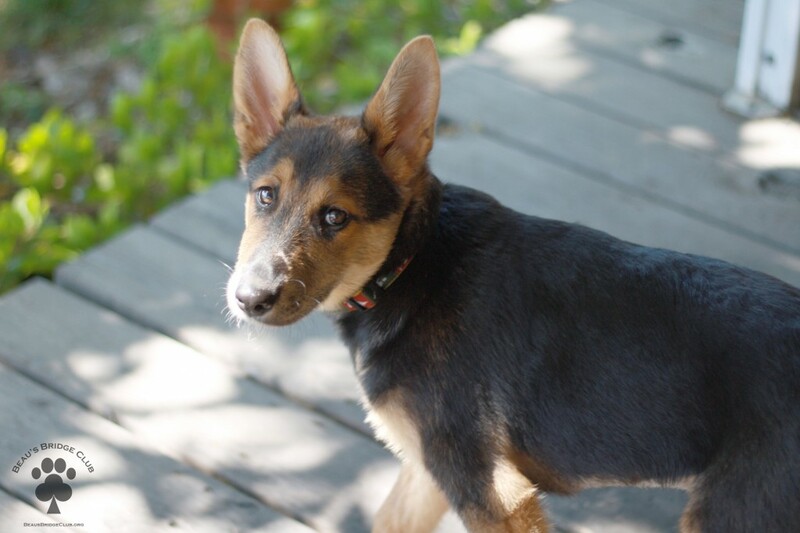 Lily is a German Shepherd (might be a mix) and weighs approximately 30 pounds as of April 29th, 2015. If she is purebred, her parents must have been small as she is a bit small for her age. Lily is spayed, micro-chipped, and up to date on vaccinations. She will also come with three months worth of her medication so that her new family has plenty of time to meet with their own vet for future medication refills. If you are interested in meeting Lily or filling out an adoption application, please email us at info@beausbridgeclub.org or call us at 510-556-1921. To download a flyer for Lily (which includes even more photos), click here.